Enhanced [#12516] (VBA): The Import Files feature now replaces the contents of existing items. Fixed [#12553] (VB/VBA): The Line Indenting feature didn’t handle correctly line continuations at the end of a comment followed by a blank line. 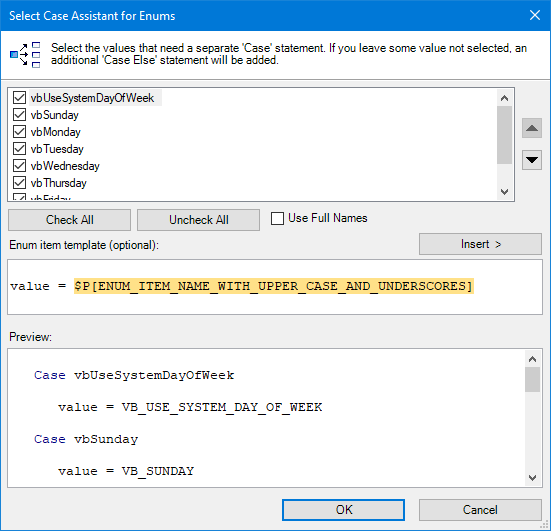 Fixed [#12559] (VB/VBA): The Select Case Assistant didn’t work in properties, only in methods. Fixed [#12562] (VBA): The Development Environment Settings Review did not run on startup. Fixed [#12575] (All): Entering by accident in the dialog to enter user-defined variable values a user-defined variable name hung the IDE. As usual, today a new monthly build of MZ-Tools has been released. This time with a small usability enhancement and some bug fixes. Enhanced [#12424] (All): The user options window now remembers the last used setting to keep open modified documents or not. Fixed [#12376] (All): The HTML documentation didn’t handle correctly constants and fields. Fixed [#12384] (VB/VBA): Constants and variables of properties were not reviewed by the Review Quality feature. Fixed [#12386] (VB/VBA): Multiple constants/fields declared using line continuation were not parsed correctly. Fixed [#12387] (VB/VBA): Declarations of Declare Function/Sub using a line continuation were not parsed correctly. Fixed [#12391] (VB/VBA): COMException happened refreshing results if the scope was current file and the file had been removed and readded. Fixed [#12410] (VB/VBA): Error “Failed to get command bar name of: CommandBarKinds.MenuBar” if the File menu entry was not the first one on the main menu. Fixed [Internal] (VB/VBA): The Code Explorer didn’t show Declare Sub / Declare Function code elements. 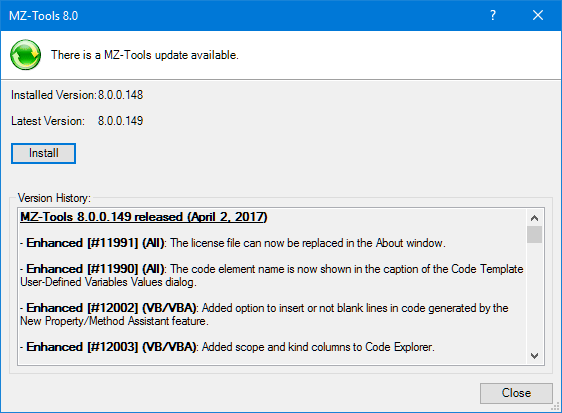 The new build 8.0.0.164 of MZ-Tools released yesterday fixes four minor bugs, but it introduces three handy enhancements. Finally, for Visual Studio users, the number of commands for code templates has been increased from 9 to 50. Enhanced [#12247] (All): Added support for enum item template in Switch / Select Case Assistant for Enums. Enhanced [#12204] (VBA): Added support for Most Used Properties (Control Explorer), Form Default Properties and Control Default Properties. Enhanced [#12250] (VS): Increased the number of commands for code templates from 9 to 50. Fixed [#12224] (VBA): The Task List could cause System.ArgumentException: (“Invalid characters in path”) saving tasks. Fixed [#12234] (VB/VBA): The Code Explorer could cause System.NullReferenceException when closing. Fixed [#12252] (VS): Expression-bodied function members caused NullReferenceException in C# 6.0 or higher. Fixed [Internal] (VS): Controls of tab pages of programming and nomenclature rules review were not themed with the Dark theme. Yesterday a new build 8.0.0.162 of MZ-Tools was released, adding some small enhancements and documenting a subject that can be interesting for some people: how to automate MZ-Tools to add / remove line numbers to a project from a build script. It also fixes some small bugs reported in the last month. Enhanced [#12154] (All): Added predefined variables for Solution Folder/Project Group Folder, Project Folder and Project Item Folder. Enhanced [Internal] (VS/VBA): Documented in help file how to automate MZ-Tools to add line numbers, etc. Enhanced [Internal] (All): Added Comment field to exception/error handler editor. Enhanced [Internal] (VB/VBA): The External Utilities feature allows now to have two external utilities with the same command but different parameters. Enhanced [Internal] (VB/VBA): The External Utilities feature shows now external utilities that use project or file parameters on the context menu of project or file. Fixed [#12170] (All): The Check for Updates feature could cause NullReferenceException if MZ-Tools was being unloaded. Fixed [#12177] (All): Fixed typos in German localization. Fixed [#12161] (VB/VBA): The Method Callers feature didn’t resolve correctly calls to properties that were made in continuation lines. Fixed [#12181] (VB/VBA): The Sort Code Elements feature did not consider public the procedures or properties that lacked the Public keyword. Fixed [Internal] (VB/VBA): The External Utilities feature didn’t show icons of external utilities on the Toolbars and Menus dialog. Fixed [Internal] (VB/VBA): The end position of the body of a procedure was not correct if there was a blank line with spaces after the procedure. Fixed [Internal] (VB6/VB5): The icons of external utilities disappeared after showing the Options window twice. 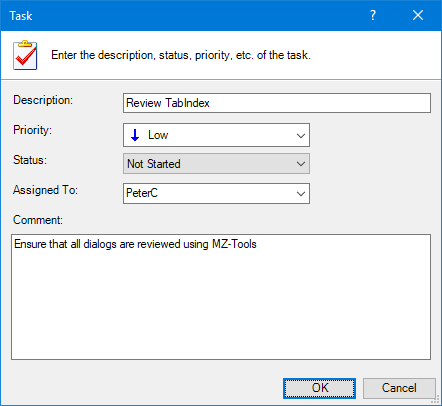 Last May 1 a new monthly build of MZ-Tools, 8.0.0.158, was released. This build continues improving the updating experience initiated some builds ago: first, it provides again a “Download Only” button for those of you who don’t want the new automated update and prefer a manual installation as before. Second, in the automated update, it prevents in many cases the error that happened when some dll was in use, asking you to close the instance of the IDE before updating. And third, it reopens automatically the IDE and the loaded project when the update is finished. In this build the headers review shows the first line of a header template that causes that the existing header no longer matches that template, which is useful to know why a header review is not passing. It also provides a context menu entry for the Insert Error Handler (VB) or Insert Exception Handler (Visual Studio). It also introduces a change, in the form of a new requirement: .NET Framework 3.5 (previously only .NET Framework 2.0 was required). But in most cases you won’t need to install it because Windows 7 provides it and on Windows 10 only MZ-Tools 8.0 for Visual Studio 2005 will require it, but not MZ-Tools 8.0 for VBA/VB6/VB5. This new version of the .NET Framework will allow MZ-Tools in the future to use internally better APIs and externally new UI technologies (such as WPF). Finally, this build fixes quite a few bugs that you have reported during the last month. Changed (VS 2005): .NET Framework 3.5 is now required if not running on Windows 7. Changed (VBA/VB6/VB5): .NET Framework 3.5 is now required if running on Windows XP / Vista. Enhanced [#12069] (All): The context menu of the code window now provides the “Insert Exception Handler” / “Insert Error Handler” meny entry. 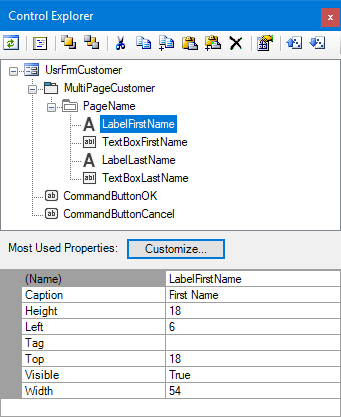 Enhanced [#12113] (All): Added new predefined variable Type Tag With Upper Case ($P[TYPE_TAG_WITH_UPPER_CASE]), useful if your constants use upper case and include a type tag. Enhanced [#12065, #12070, #12071] (All): The setup now shows a better message to close the IDE that is locking a file when updating. Enhanced [#12065, #12070, #12071] (All): The setup now reopens the IDE and project or Office document that was open before closing it for updating. Enhanced [Internal] (All): The Headers Review now shows the line of the header template that causes that the reviewed header doesn’t match it. Fixed [#12068] (VBA): The Code Explorer didn’t respond to changes in the active file after unlocking a password-protected database. Now clicking the Refresh button starts responding. Fixed [#12032] (VBA): In the Control Name Assistant, the Tab key inserted a Tab character in the textbox if a message box was shown (such as invalid name or state loss). Fixed [#12081] (All): System.IO.IOException was not handled gracefully when deploying options files to a folder. Fixed [#12090] (All): The Browse Folder dialog caused COMException 0x80040111 on Windows 7 if themes were deactivated. Fixed [#12096] (VB/VBA): The Headers Review failed in some cases using user-defined variables. Fixed [#12106] (All): The Programming Rules Review didn’t locate the exact code when using the “Any of these values” option instead of the “This value” option and didn’t show all violations. Fixed [#12103] (VBA): The type tag editor and other features didn’t show 32-bit type libraries when using the 64-bit VBA editor. Fixed [#12133] (VS): Shared projects were not supported. Fixed [#12123] (VB6/VB5): Several features such as Find Text could crash a project if it contained many forms due to a leak. Fixed [Internal] (All): The Headers Review didn’t review if there was more text or lines after the lines of a valid header. Fixed [Internal] (VBA): Several features didn’t work correctly with the Page control in some versions of Office. Fixed [Internal] (VBA): The Check for Updates feature of the portable edition offered the Install button when it should offer only the Download button. Fixed [Internal] (VS): Icon of Keyboard Shortcuts in Options window was not correct when using the dark theme. Fixed [Internal] (All): The Programming Rules Review didn’t show a friendly message if some regular expression was not valid. 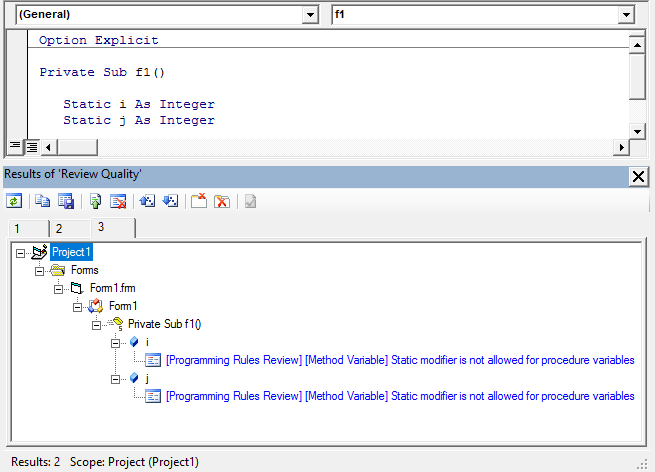 Fixed [Internal] (All): The Programming Rules Review didn’t work in some scenarios using the Any Code Element rule kind. Enhanced [#11991] (All): The license file can now be replaced in the About window. Enhanced [#11990] (All): The code element name is now shown in the caption of the Code Template User-Defined Variables Values dialog. 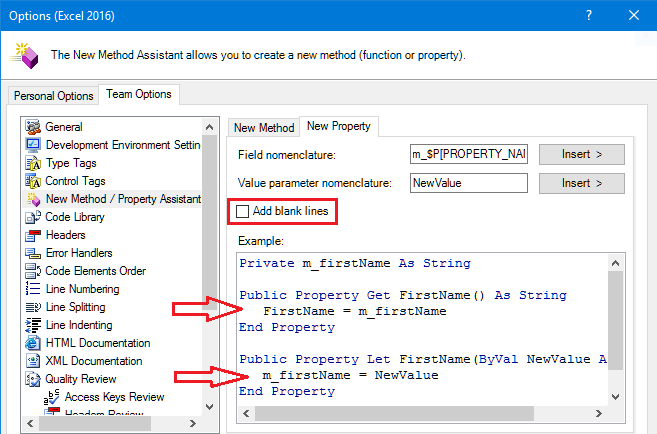 Enhanced [#12002] (VB/VBA): Added option to insert or not blank lines in code generated by the New Property/Method Assistant feature. 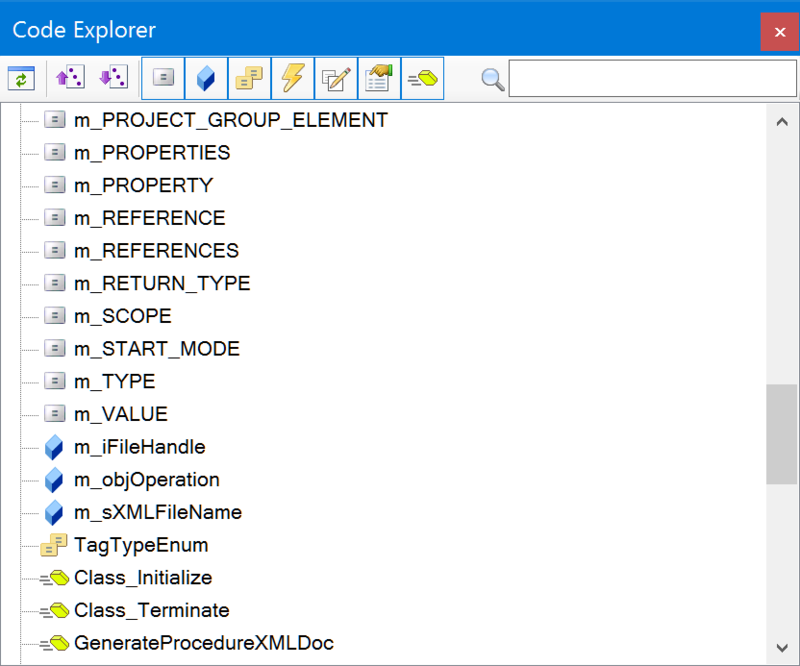 Enhanced [#12003] (VB/VBA): Added scope and kind columns to Code Explorer. Fixed [#11910] (All): The setup shows now an error message to close the IDE that is locking a file. Fixed [#11972] (All): The Options files were not read again once the connectivity with the drive that contained them was restored (USB drive, network folder, VPN, etc.). Fixed [#11975] (All): The Code Explorer could cause NullReferenceException. Fixed [#11993, #11594, #10722] (VBA): The Dead Code Review could cause COMException (0x800A9C68) when retrieving the Name property of a UserForm. Fixed [#12005] (VS 2015): The Dead Code Review could cause System.InvalidOperationException “Ildasm File Full Name is null”. Fixed [#12020] (VB/VBA): The Sort Code Elements feature didn’t allow conditional compilation directives inside properties. Fixed [#12037] (VB/VBA): The New Method/Property Assistant failed when used on a class whose name started with “I” because it is an interface. Fixed [#12036] (VS): The line numbering feature of VB.NET didn’t exclude lines starting with the “Into” keyword. Fixed [Internal] (VS): Some windows were not shown correctly with the Dark theme. This bug was introduced in non-public build 8.0.0.136. Fixed [Internal] (VS/VBA): The Next Item button on the Control Explorer toolbar didn’t have the correct size in high DPI displays. Fixed [Internal] (All): The icons in the explanation zone of the Options window didn’t have the correct color depth.